They’ve released here in the past, though admittedly not since their debut self-titled album. 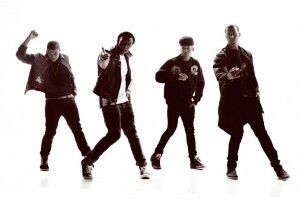 But over in their native UK, the boys from JLS are powering along with their career, yesterday announcing the forthcoming release of their new album ‘Evolution’. The LP is the boys fourth is aptly titled, given the boys are moving away from the more mainstream pop sound of their previous releases and towards a more mature urban sound, crafted by the likes of the legendary Rodney Jerkins. Lead single ‘Hottest Girl In The World’ will give the boys’ fans their first taste of the new direction when it debuts on UK radio on Thursday this week. The shot above (© Idil Sukan/Draw HQ) is taken from the official clip for the single, due to drop soon. The single will be released in the UK on October 21, with the album out on Monday November 05. No word on an Australian release for either at this stage. Almost 2 months between radio release and single release? Wow.